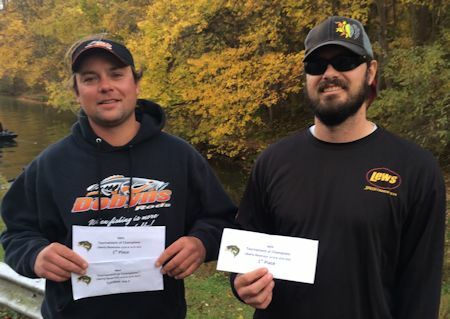 The team of Craig Gordon and Holden Wolfe had a strong 2-day showing, with biggest bags each day for a total of 21.98 Lbs and the championship victory. 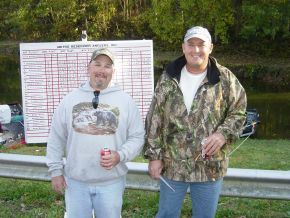 The father-son team of Chad Wisner and Lenny Wisner bested the field in the 2-day TOC with a winning weight of 38.19 lbs. 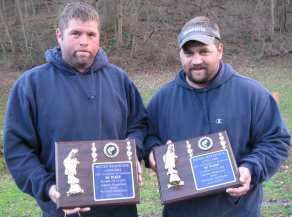 This was the 2nd tournament win in a row and an exclamation point after also winning Anglers of The Year. There were only 3 limits caught by the 9 team field during the two day event. 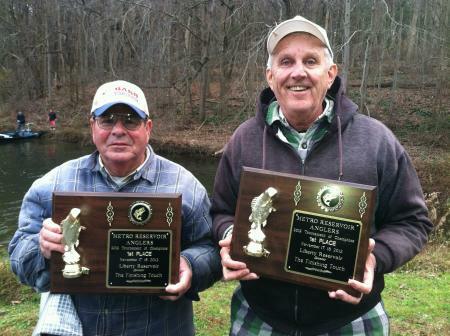 The team of Rob Bertazon and Ron Broadwater claimed the victory with two of those limits. 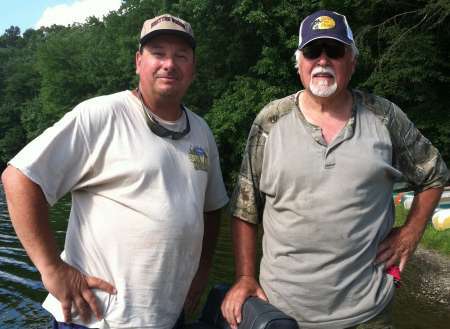 Rob and Ron weighed a total of 25.04 Lbs. of Prettyboy bass. 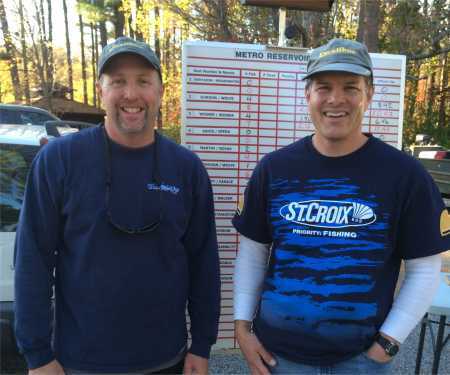 Matt and Victor brought 32.97 LBS of Liberty Bass to the scales in the two day event. Their 18.18 LB bag on Day 1 (the biggest bag of the tournament) included the 4.50 LB lunker of the day. Their 14.79 LB bag on day two of the event, included the 5.67 LB lunker of the day. The team of Mills and Tison who led the 2009 TOC at Liberty after day 1 held on for the win during an even tougher day 2 when most weights dropped. 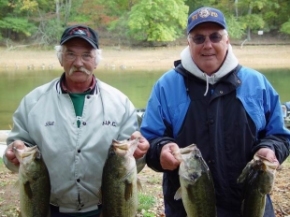 Russ Ashwell and Steve Snider managed two big limits of fish despite a blustery Day 2. In so doing, they captured the 2008 TOC and amassed the heaviest 2-day total in TOC history. 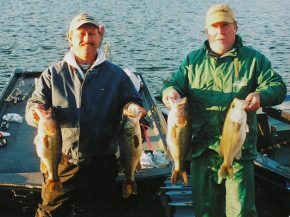 Rob Bertazon and Ron Broadwater, 2005 Anglers Of The Year, came back from 8th place on day 1 to take the 2007 Tournament of Champions at Prettyboy Reservoir thanks to an impressive 8 fish, 16.95 lb. limit on day 2. 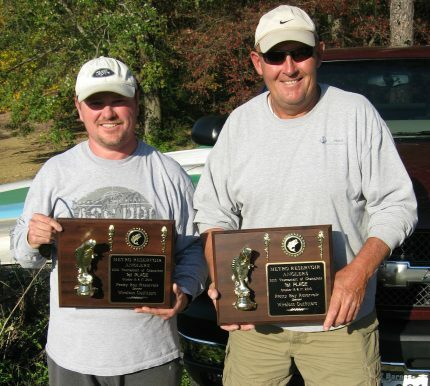 The 2006 Tournament of Champions was held on Liberty Reservoir, November 4th and 5th. 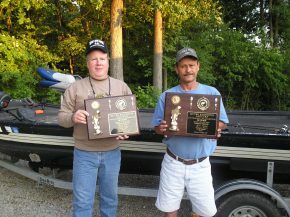 The team of Isaac and Kirk were again crowned TOC Champions, with a 2 Day total of 8 fish weighing 23.87 lbs. 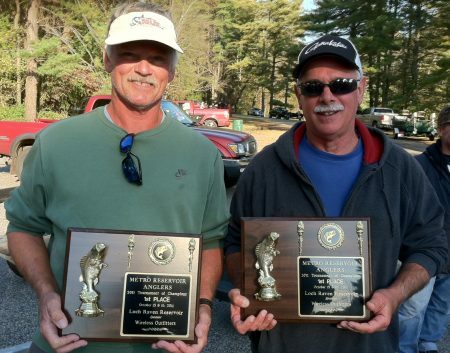 Gary Lippa and Ed Meushaw again displayed the consistency that makes them especially tough at a two-day tournament. 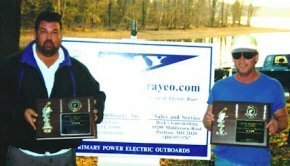 The 2004 Tournament of Champions was held on Prettyboy Reservoir October 23rd and 24th and the newly formed team of Mike Isaac and David Kirk were crowned Champions with a 2 day total of 24.83 lbs. 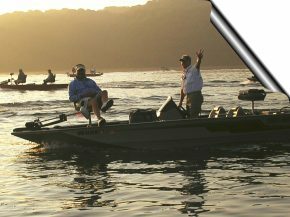 It was no surprise when the team of Gamber and Walker capped off a string of winning 3 out of the last 4 tournaments of 2003 with the TOC on their home lake. 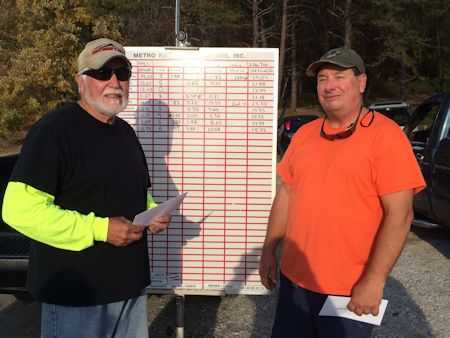 While other first round leaders struggled on the second day, Rich and Caudill hauled in an impressive 21.89 pound limit to clearly outdistance the field in the 2002 Tournament of Champions held October 19th and 20th at Loch Raven Reservoir. Davis and Ruby Win 2001 Tournament of Champions! 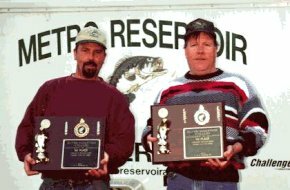 Davis and Ruby outdueled the weather and anglers on drought-stricken Prettyboy Reservoir to capture the 2001 Tournament of Champions with a 2-day weight of 30.63 pounds. Kirk and Parrish Season Champions! 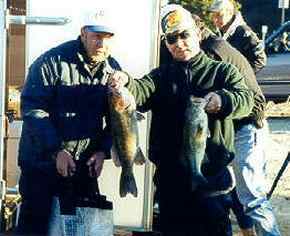 David Kirk and Wes Parrish captured the top prize in our 2000 season ending Tournament of Champions by overcoming tremendous adversity and withstanding as breathtakingly close weigh-in on the final day. 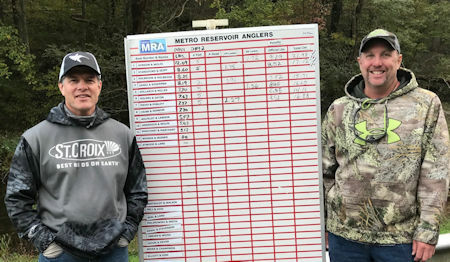 Tom Brown and Walt Miciche nailed down their first MRA, Inc. victory in convincing fashion by greatly outdistancing the field in the 1999 Tournament of Champions held at Loch Raven Reservoir on November 20 and 21, 1999. 09 2010 Bertholdt and Gamber Bertholdt and Gamber comeback to take 2010 TOC at Prettyboy. 18 2001 Davis and Ruby Davis and Ruby Win 2001 Tournament of Champions! 19 2000 Kirk and Parrish Kirk and Parrish Season Champions! 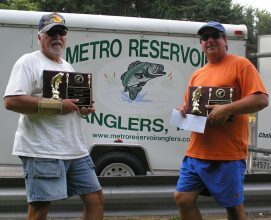 Baltimore Metro Reservoir Anglers, Inc. all-electric bass tournament trail at Prettyboy Reservoir, Loch Raven Reservoir, Liberty Reservoir. 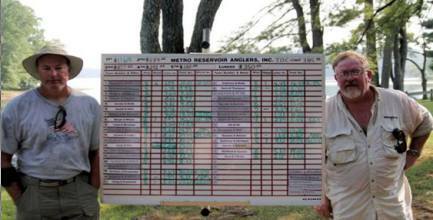 Tournament schedule, results and Angler of the Year standings. 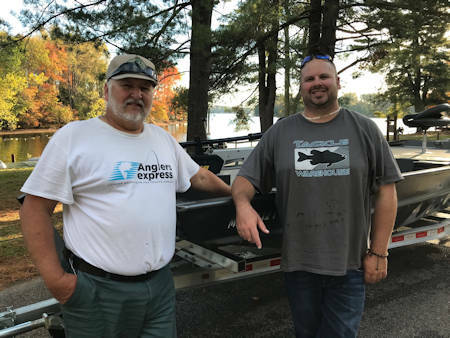 Friday, September 4th – Loch Raven Reservoir. Sunday December 6, 2015 at Liberty Reservoir. Friday, September 26th at Loch Raven Reservoir. 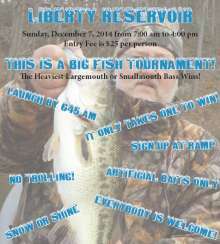 Sunday December 7, 2014 at Liberty Reservoir.